I love the Great Glebe Garage Sale. In terms of exciting annual events, it's right up there with Christmas (although nowhere close to Halloween). We got off to a bit of a late start, but Chris and I still managed to find some real treasures to bring home in the little red wagon. Funky old film reels ($1 for both! 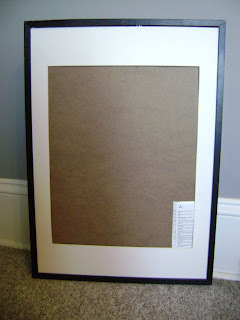 ), a felt hat ($1.50) and a wooden frame for silk screening (50 cents). Military badges ($5), a glass dome ($2) and a cute bottle (50 cents). Speakers for the stereo a friend very generously gave to us a few months ago ($35). Finally, a tulip table base for only $10! We need a bar height table for the kitchen, so this piece is too short to use as-is, but I'm sure we can come up with a way to make it work. I'm glad we didn't have as far of a walk as last year, it was quite a load for our little wagon! Don't you just love Metric? I've donated a custom record painting to a charity auction, so if you've landed on this site through that, thanks for checking out my work and supporting the United Way! 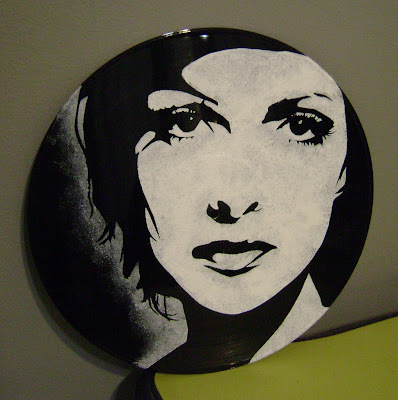 You can see all my painted record posts here. Inspired by the transit scroll craze and the awesome Beatles lyrics art over at Cozy Little Cave and in this house tour, I made Chris a present from some junk I had lying around the house. and then painted the whole thing black. A little bit of stenciling later, voila! Two years ago today, Chris walked into my life, 15 minutes late. I'm so glad I stuck around to wait for him. I guess I have a habit of taking apart cute stuffed animals. 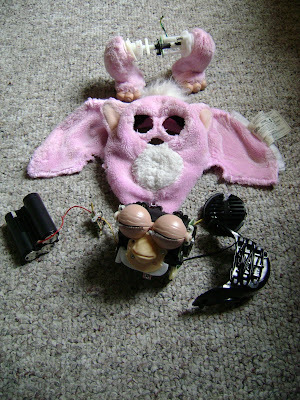 I recently took apart two Furby Babies I picked up on kijiji for $5. Unfortunately, Furby Autopsy wasn't much help since the Furby Babies are put together in a different way, but I was able to figure it out. Much like the full-sized Furbys (funky pluralization, I know...), Furby Babies have one motor that runs a bunch of gears to get all the adorable animations moving in sequence. When you get rid of the circuits that control when the motor starts and stops it simply cycles through all the motions continuously. It's this feature that I plan to exploit for my dinosaur. Did I forget to mention that the dinosaur I'm building is going to be animatronic? 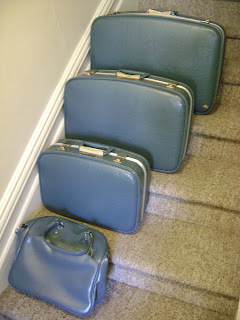 In case you're wondering, I've already given away everything from the pressure sensors to the Furby pelts on freecycle. I'm hoping they'll be used to build an awesome robot but they might just wind up as misguided cyberpunk art. 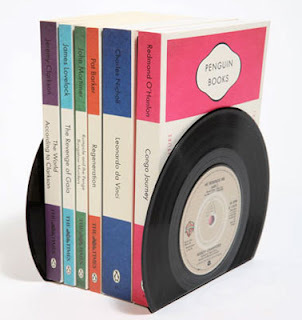 Retro To Go posted about these bookends made from vinyl records being sold at Urban Outfitters. If you like the look but would rather not spend the £20, you can make your own in 5 minutes. It's as simple as dipping the record in boiling water and bending it to the right shape. I've made a full how-to over on instructables. Okay, that might be overly dramatic, but when I can't breathe, my eyes are all red and I can't sit still because I'm itchy from head to toe, it feels like I might rather die. I never used to have allergies, but when I hit my twenties I started to notice my nose was always runny and things got progressively worse. It's now normal for me to go through at least one box of Kleenex a week (thankfully they're compostable!). Since moving into the tta, it's become unbearable. I recently got tested and was not at all surprised by the results. We've never let her into the bedroom, but Simone still manages to shed her hair and dandruff onto every surface in our apartment. 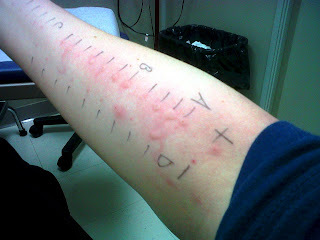 I'm also allergic to the rats but they're so much smaller and contained it wasn't a big problem when I only had them to deal with. Is the meat garnish catching on? Chris and I decided to try out The Exchange the other day. After several hours of shopping, we were in need of some drinks. 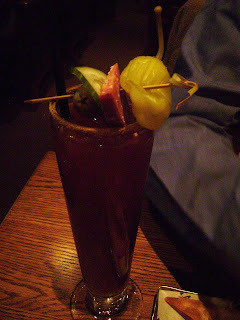 Yes, that's a piece of meat nestled between the cucumber and jalapeno. I think it was peperoni. Does this mean that meat garnishes are catching on? How long before I can order a McNuggetini from Ottawa's finer establishments? I'm not going to lie, I totally have a huge girl crush on Alie and Georgia. But especially Georgia. Felt flowers to the rescue! 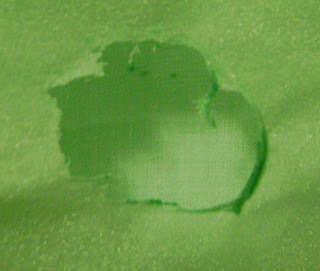 I melted a hole in my prom dress. Princess Lasertron's felt flowers to the rescue! I originally ordered the materials to make a headband and matching boutonniere but they turned out to be just what I needed to patch my dress. I put three flowers on my dress and I still had enough pieces to make some accessories too. We had a blast at Promdemonium and I can't wait for next year!